Good Time Ridge Farm, LLC is a farm located in Augusta, West Virginia owned by Harald & Cheri Seiler. Check out our males. Almost all of the males will be sold for $250 to $1000, some are less. Matrix, Jeremiah, Jericho, Prince Phillip, Augusto and many others are in the genetics of these animals. This special will not last long. Good Time Ridge Farm started raising alpacas in 2008, with the purchase of 2 pregnant females, 1 young unproven male and a gelding. We have grown to 120+ animals with the genetics of Snowmass Artic Blue, Augusto, Hemingway, Jericho, Royal Fawn, Matrix and many, many more. In 2013, we added 2 miniature silkie fainting goats. 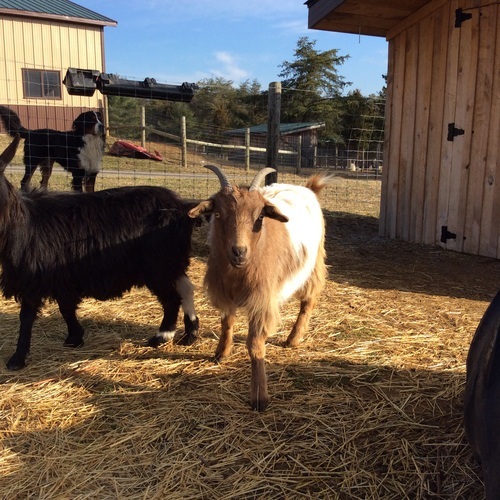 They were so much fun we added a breeding buck to the herd and started raising goats. We have both extreme coats and long coats. To make things even more interesting in 2015 we added Southdown Babydoll Sheep to the mix, 2 ewes and 2 bucks. These will make a great addition to the farm and wool to mix with the alpaca. Good Time Ridge is located in the rolling hills of West Virginia, approximately 30 miles west of Winchester. We offer all the services of the large farms, in a small farm setting. Stop by, visit and let us show you the laid back life of wild wonderful West Virginia.